Spectral Utilities offers innovative micro-utility services for temporary, off-grid and smart-grid applications. Spectral Utilities provide resources for modern demand in a fully renewable way. The Solar Transformer is quick to deploy and easy to use, giving you renewable energy wherever you need it. Solar power is stored in a sophisticated onboard energy storage and distribution system. It can power a household or office, or be used as a portable energy station. The Solar Transformer was built with a modular approach. Each of the following three modules can be detached and used as a stand-alone module: Solar Charging Station – Peak Shaver Power Pack – Universal Hydraulics Control Station. The Solar Transformer can replace a diesel generator or be used in combination, drastically reducing the number of hours of generator runtime. This translates to an extended generator lifespan and thousands of euros saved on fuel and maintenance costs. It provides renewable energy silently with zero harmful emissions. When not in use as a mobile generator, the Solar Transformer can feed back electricity into the grid to pay for itself over time. 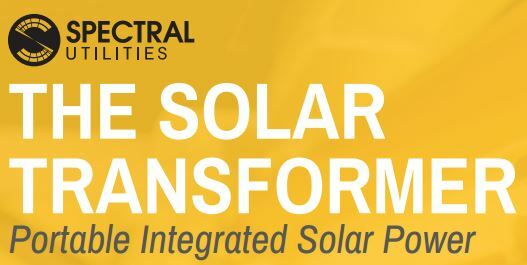 The Solar Transformer (PDF) is built in a self-contained housing. The steel frame was designed for easy mobility and fits within a standard 6-meter sea shipping container. It can also be placed on top of a 6-meter flatbed trailer for easy transport and onsite mobility. The Solar Transformer is prepared for lifting by forklift, crane, or helicopter. 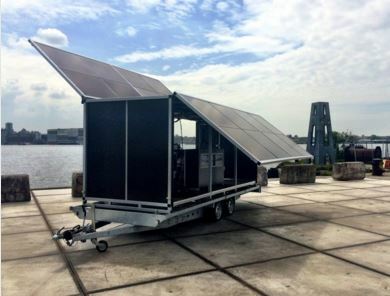 The Solar Transformer can be used as a stationary power station to power a home or office, or it can be taken on the road for high-capacity portable power.